2020 ITS provides complete restaurant management solutions which focus on cost and cash control while improving service levels and streamlining daily, weekly and monthly business processes. 2020's line of online (web based) restaurant management products are extremely easy to implement, all you need is Internet access and a browser. View the latest Restaurant News stories from New York Times. 2020 IT Solutions Corp. officially released HyperVision 2.2, the complete back office management system for restaurants. Mark Thompson, President and CEO stated "The 2.2 release provides electronic ordering and invoicing with Sysco Food Distributors (all distribution centers). The bottom line is Sysco provides an extra discount (due to reduced costs), and data entry of purchases (invoices) is eliminated. This is a great time (and money) saving feature. The new release also provides electronic franchise reporting for Wendy's. The future looks very bright for our clients, franchises, client vendors and 2020." 2020 IT Solutions Corp. officially released its new website today. The release provides additional information about 2020 ITS products and solutions. Gary Campbell, Senior Software and Web Developer for 2020 ITS stated "Significant research, development and technical effort was expended to improve usability, content clarity and W3C standards compliance. With HyperScheduler™ (our online employee scheduling software), future improvements slated for HyperVision™, and by leveraging our website's new infrastructure to expose our products and services Internationally, we expect 2010 to be a record breaking growth year." The National Research Council awarded 2020 ITS a grant of $190,000 to continue research and development of their restaurant and hospitality line of products. Mark Thompson, CEO of 2020 ITS stated "This country is home to world class technology and brilliant, innovative people. We are thrilled to be recognized by the National Research Council for our efforts in advancing hospitality technology in North America". Issues surrounding labour were a hot topic at this years annual Bar and Beverage Show held at the Stampede Ground in Calgary. Two of the seven seminar topics covered Employment Issues, including "How to Recruit and Training the Best Staff", and Mark Thompson's seminar titled "Leading Edge Staff Scheduling Software™. The seminar given by Mark Thompson, CEO of 2020 ITS, focused on all the issues surrounding scheduling and how it is difficult to create effective and efficient staff schedules without automation. He looked at how it is ever more difficult to attract the right staff - once you have them you need to schedule them to meet the needs of your restaurant customers. Dumac Business Systems and 2020 ITS announced a strategic alliance at the Wendy's International convention in Orlando, Florida. The agreement between the two companies provides for the integration of DUMAC's web-based SBOnet ® (SmartBackOffice.net) application with the web-based 2020 ITS Staff Scheduler. The alliance allows customers to take advantage of the robust reporting, inventory and food cost capabilities of SBOnet® along with 2020's proven employee scheduling service. The 2020 Staff Scheduler's use of proficiency levels will be of particular benefit to Dumac's existing clients, ensuring that only fully-trained staff members are scheduled for the busiest times of the day, with the most highly qualified staff working each station. This will lead to increased customer service levels, increased sales, and more profits for Dumac's customers. 2020 ITS has announced the launch of its 2020 Labor Scheduler to the hospitality market. 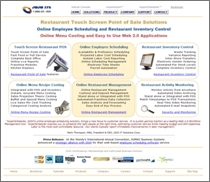 Integrated with 2020 HyperVision, a Web-based back-office management system, the 2020 Labor Scheduler allows restaurant managers to create and save schedules in a paperless environment. The scheduler generates staff schedules based on sales forecasts and staffing rules, then allows users to tweak shifts, plan breaks, change roles, split shifts and change employee assignment. The scheduler also is able to track employee pay rates, promotion rules and hours worked and includes other features such as birthday reminders, proficiency levels, staff availability, turnover and comparison of actual to scheduled hours. 2020 ITS showcased their Digital Menu Board and Kitchen Prep Solution at the NRA trade show. Developers of both hardware and software, 2020 ITS was showing two new products: the 2020 Digital Menu Board and the 2020 Dynamic Kitchen Prep, which they offered as part of their clearly labeled "Total Solution" which includes 2020 HyperPOS, 2020 HyperVision, 2020 HyperScheduler and 2020 Digital Video Security... more..